Camiseta Manchester United FC 2015-2016 Away. Parte de la colección oficial 2015-2016 Manchester United FC. 2015-16 Man Utd Away Mini Kit (Blind 17). 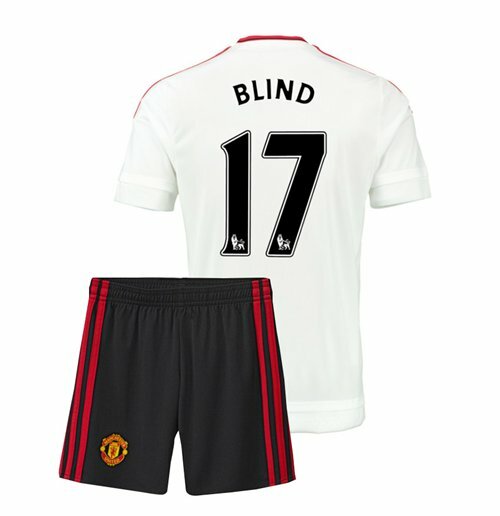 Official Daley Blind football shirt for the Man Utd football team. This is the new Man Utd away mini kit for the 2015-16 Premiership season which is manufactured by Adidas and is available in kids sizes.This Spain football shirt is red in colour and comes with Daley Blind shirt printing on the jersey, including the front number.